Unlike in Word 2010, older versions of Microsoft Office aren’t able to read or edit OpenOffice.org ODT formatted documents. To get around this problem, all we need to do is change our ODT files into readable DOC files. And, to do that we can use a free built-in program that came pre-packaged with Windows. Note: Office 2010 by default supports .odt format, so this is only useful if you are running 2007, 2003, or an even older version. *If WordPad does not appear on this list, you can still use it from the Choose default program menu. Now that the file is open in WordPad Click the File menu to the left of the Home tab. From the menu list Select Save as > Office Open XML document. Now, name your file as you see fit to whatever location you like. 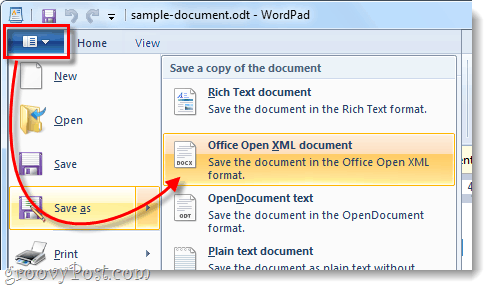 Your file should now be in the .docx format and readable by any version of Microsoft Office Word. I like this solution because it is simple and doesn’t require installing any additional software to convert your OpenOffice.org documents. Wow, this blog helps! I finally converted odt formatted document to doc file format. Thanks! It still just shows some random letters, it looks russian or chinese, how come this happens? This work round only works if you are running Windows 7. This does NOT work with XP’s Wordpad. Awesome! Thnx for the feedback Julia. Maybe a stupid question, but does this also work on an ordinary smartphone and/or a BlackBerry (haven’t got one right now, so I can’t try)? Or how can I edit .odt files on a BB? Very helpful post. I have been trying to figure out how to convert OpenOffice documents for quite some time. It couldn’t have been easier! Works a treat on Windows 8. Thanks a lot. Spent ages looking for a converter and at the end of the day your simple fix does the job. Doesn’t work as shown with 8.1 at all. Seems the best way to convert odt to doc formats, is to saveas RTF format in openoffice. I’ve tried all the ways above, and no other method preserved Headers & Footers. For just plain text type docs the above works fine, however most docs will have the aforementioned Headers & Footers. We are working on a book. Are using ms Word 2007. Our editor is using open office. When we mail the script so her Everything is fine. when we get it back we got a lot of problems. biggest problem is the print screen we have inserted, they are coming back with Everything around or in totally wrong format. it also happens with charts made of excell in the Word document. and sometimes the headlines get wroing. big problem. is there a way to get out of that problem? we have also tried with Word 2010 and it is the same problem. would be nice to hear if there is anything to do. Thanks for this tip. The major crippling factor in OpenOffice for me is you can’t perform a global search through thousands of OOo documents without being a rocket scientist. I threw in the towel and now converting all my OpenOffice records into doc or docx en masse. You’ve been most helpful! For goodness sake; just download/install OpenOffice, then save-as MS-word. Or, just use OpenOffice. The problems *you* have using msword, when others are using openoffice, is 1000x worse for those others when you insist on using msword. OpenOffice is free, cross-platform, and feature-compatible with msword. It has some differences from msword, but that’s not to say that msword “does it right”, it’s just that you’re used to one way of doing it. Anyone new to msword would have the same types of issues & frustrations as someone new to openoffice. Hey man, great stuff. Helped me out of a hole. Thanks. Great…I was struggling in other way….Thanks a lot. Thanks for this tip! Grazie! I have WIndows 8.1 – did not work at all for me! Austin, yes I did use “Wordpad” – tried twice and I still have all of the garbled type. As you can probably tell, I’m not the most savvy computer tech in the world. This file is important as it’s a backup of my laptop from 2015. I don’t know why, but I saved it in the following formats: csv, pdf, txt, xlsx; none of which I can convert to a document which I believed I had saved under initially. Anyway, thanks for your response – I see I’m not the only night owl out there!!! right. is there a way to preserve formattig? Using Open Office 3.4.1 on Windows 7 Pro. I’m working on a book and the conversion seems to have retained the fonts and hyperlinks, but it looks like all the images are out on permanent vacation? Also, the margins are shot. Just a heads up, this trick does work for plain text documents but I wouldn’t recommend it for a 400+ page book ;) Time to bite the bullet and purchase Office I guess…Ugh. This is really helpful blog. I converted odt formatted document to doc file format very easily. Thanks! SOOO happy to find this article, which in turn helped me discover the groovyPost.com blog :) This tip worked like a CHARM! TY TY TY! Guys I tried converting odt to .docx by opening it on Wordpad(which displayed me some other language texts ovio) and then saved it as a .docx document..but still it didn’t worked for me…am working on it…better luck to u all..
Wow, ive been stuck on this for days. You bet Renate! I’m glad you enjoyed the articles. Welcome to groovyPost. does not show any problem, but the file still is odt. it works i must change the file name as well.